Amnesty International (AI) has criticised the LTTE for deliberately targeting civilians in an extended series of attacks. The London based human rights group notes that it is a basic principle of international humanitarian law that persons fighting in armed conflict must, at all times, distinguish between civilians and combatants and between civilian objects and military objectives. “It is not unlawful to target combatants for attack, where legal means and methods are used; however specific rules aim at protecting civilians and other non-combatants. AI said in a statement relating to the assassination of Minister Jeyaraj Fernandopulle in which several civilians were also killed. The organisation is alarmed that since the abrogation of the ceasefire agreement in Sri Lanka on January 16, the conflict continues to involve the intentional targeting of civilians and indiscriminate attacks. According to the International Committee of the Red Cross (ICRC), 180 civilians died in the first six weeks of 2008 and nearly 270 more were injured in a series of attacks on civilian buses, railway stations and individuals in Colombo, Dambulla, Kebhitigollewa, Madhu, Okkampitiya and Welli Oya. 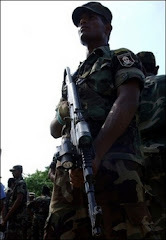 AI further says that as suicide bombs kill and injure civilians in the south of Sri Lanka, ongoing offensives in the north and east continue to affect families in conflict-affected areas. One continuing example is the situation near Madhu Church in Mannar District in the north of Sri Lanka. “As a result of intensifying fighting, a historic statue of the Virgin Mary has been removed for safety from the Madhu shrine. The LTTE is reported to have used communities around the Church as ‘human shields’ and Amnesty International has in the past raised concerns about the recruitment of children by the LTTE from families living in the locality. The government for its part in April 2008 reportedly shelled civilian areas around the Church. The Mannar Bishop, Rt. Rev. Dr. Rayappu Joseph has repeatedly appealed to both sides to respect the Madhu area as a no-conflict zone,” AI added. AI notes that under international humanitarian law, parties to armed conflicts, including non-international ones such as in Sri Lanka, must take special care to protect cultural property, including buildings dedicated to religion, from damage unless there is imperative military necessity to do otherwise. AI is urging the LTTE to stop immediately any direct or indiscriminate attacks on civilians, condemn all such acts publicly and state that they would not be tolerated; to immediately suspend any persons suspected of participating in (including ordering) violations of international law from any position or placement in which they may commit additional violations and to ensure that their forces take special care to avoid damage to cultural property, including buildings dedicated to religion. AI also urges the government to ensure that all security force personnel respect obligations under international human rights humanitarian law, ensure that its armed forces take special care to avoid damage to cultural property, including buildings dedicated to religion and allow the establishment of an independent, international human rights monitoring presence on the ground without delay.